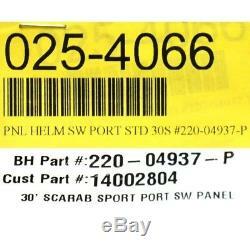 Boat part number 8201374 is a new OEM portside helm switch panel for a Wellcraft 30 FT. This gray and black panel is constructed out of aluminum with a glossy cross hatched pattern. 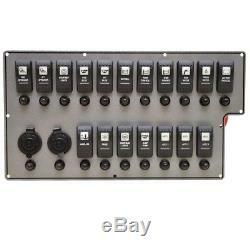 This switch panel measures approximately 14 3/8" L (tapers to 13 18" L) x 7 3/4 H overall. There are (10) approximately 1/4 diameter mounting holes around perimeter of panel. 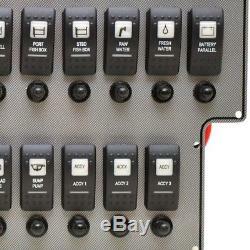 Features the following illuminated 20A 12V switches. (1) Illuminated On/Off FWD Spreader Rocker Switch. (1) Illuminated On/Off AFT Spreader Rocker Switch. (1) Illuminated On/Off Courtsey Lights Rocker Switch. 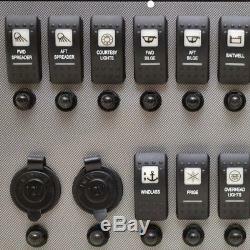 (1) Illuminated On/Off FWD Bilge Rocker Switch. (1) Illuminated Off/On/Off Baitwell Rocker Switch. (1) Illuminated On/Off Port Fish Box Rocker Switch. (1) Illuminated On/Off STBD Fish Box Rocker Switch. (1) Illuminated On/Off Raw Water Rocker Switch. (1) Illuminated On/Off Fresh Water Rocker Switch. (1) Illuminated Momentary On/Off Battery Parallel Rocker Switch. (1) Illuminated Momentary Off/On Momentary On/Off Windlass Rocker Switch. (1) Illuminated On/Off FRIGE Rocker Switch. (1) Illuminated On/Off Overhead Lights Rocker Switch. (1) Illuminated On/Off Sump Pump Rocker Switch. (1) Illuminated On/Off ACCY 1 Rocker Switch. (1) Illuminated On/Off ACCY 2 Rocker Switch. (1) Illuminated On/Off ACCY 3 Rocker Switch. (8) 5A Push-Button Breakers w/ Boot. (9) 10A Push-Button Breakers w/ Boot. (3) 10A Push-Button Breakers w/ Boot. (1) 2-Pin Female Gray / Green / Orange Connector. (1) 3-Pin Female Gray / Green / Orange Connector. (1) 12-Pin Female Gray / Green / Orange Connector - Only 11 Pins active. (1) 2-Pin Female Gray / Orange Connector. (1) 4-Pin Female Gray / Orange Connector. (1) Single Pin Female Black Connector. (1) Single Male Black Connector. Model: 30 FT Scarab Sport. Color(s): Gray / Black. Overall Dimensions: 14 3/8" L (tapers to 13 18" L) x 7 3/4 H. Customers please note every computer shows colors differently. No need to feel left out. You may also reach us using the Ask a Question link at the top of the page. Feel free to send us a message any time! The item "Wellcraft Boat Helm Switch Panel 025-4066 30 Scarab Sport Gray Black Aluminum" is in sale since Monday, November 5, 2018. 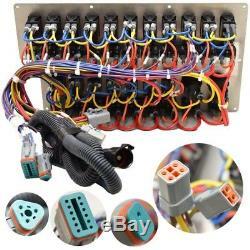 This item is in the category "eBay Motors\Parts & Accessories\Boat Parts\Body Parts". The seller is "greatlakesskipper" and is located in Racine, Wisconsin. This item can be shipped to United States, Canada.